Coldwell Banker Home Town Realty has been finding solutions for home buyers and sellers in the Potomac Highlands since 1987. What began in a single office has grown into a multi-county enterprise. Since becoming affiliated with Coldwell Banker® in 1993, Home Town Realty has extended its reach into countless facets of the home buying and selling process. Whether we’re aiding homeowners with appraisals, relocation services, or any number of other real estate services, Coldwell Banker Home Town Realty is ready to help. The nation’s oldest real estate organization, Coldwell Banker® was founded in 1906 and has helped millions of families find homes over the years. By working with Coldwell Banker®, you have access to over 200,000 properties for sale, as well as access to the most knowledgeable real estate professionals in the world. Whatever your needs may be, Coldwell Banker® is here to help. Coldwell Banker Home Town Realty is backed by the extensive resources and the 100 year heritage of the premier real estate organization, Coldwell Banker®. Take advantage of the marketing expertise of our team of dedicated professionals. We at Coldwell Banker Home Town Realty are prepared to fulfill the promises in the Coldwell Banker® Seller Service Guarantee. 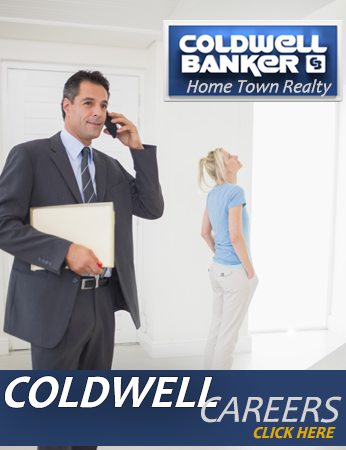 Contact Coldwell Banker Home Town Realty today; your satisfaction is our top priority!